We are in the middle of an epidemic here in America. One that has gone mostly unnoticed, and is just starting to really gain the respect of many health care practitioners. 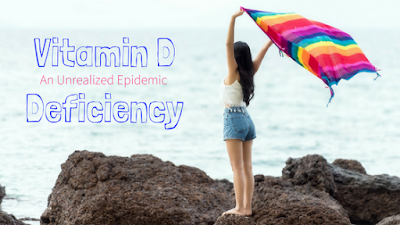 Vitamin D deficiency has become a major problem, is linked to other major problems, and until recently has not been seriously considered a problem at all. Now epidemic is a scary word, and one that we see thrown around quite a bit these days. However, I don't use it lightly. Over 90% of adults in America are Vitamin D deficient, and that deficiency is linked to quite a few other health conditions that have become prominent in recent years. Conditions such as osteoporosis, heart disease, high blood pressure, diabetes, autoimmune disease, depression, insomnia, arthritis, asthma, fibromyalgia, autisim, and even more. So why is this particular vitamin so important? Vitamin D helps your body absorb and use calcium, it plays an important role in proper neurological and muscle function, helps balance blood sugar, combats heart disease, and it helps to keep your immune system healthy. Now there are two kinds of Vitamin D, the one we synthesize, in our own bodies, when exposed to the sun is D3. There is another kind of Vitamin D that you can get from consuming plants and other animals (D2), however it's not as bioavailable to us as D3. 10 minutes a day, in the sun, is all you need in order to allow your body to create enough Vitamin D, according to the experts that is. Living in Florida, the “Sunshine State,” you'd think that we'd get enough sunlight to do just that. Well, we get the sunlight, but there are other problems that prevent us from getting the correct amount of Vitamin D that we need for optimal health. Most people will pinpoint the increased time we spend inside, as a society, as the main reason for the rise in Vitamin D deficiencies. It's true that the inventions of air conditioning, the internet, video games, and personal computers, as well as an increase in desk jobs, do contribute to our lack of venturing outside. However, our lack of outdoor activities are only part of the problem. Quite a few of the problems actually stem from poor dietary choices, even when those choices are made for all the right reasons. Most of us feel pressure to be skinnier than we are. Fad diets have been on the rise for decades, and not all of them are healthy choices. Most of them leave out many of the good nutrients along with the bad, or substitute nutritionally deficient food choices for already poor food choices. Combine this with the concern about cholesterol levels and obesity, and you get a crazy amount of low-fat or no-fat diets. But fat and cholesterol serve quite a few important jobs in our bodies. Cholesterol helps to keep our brains healthy, helps to keep our skin plump and supple, and without fat or cholesterol we cannot synthesize and absorb Vitamin D. Vitamin D is fat soluble, which means that it is dissolved (and stored) in fats and oils. Our bodies need fat in order to use and store Vitamin D. However, polyunsaturated fats (the not so good for you fats) also block absorption and use of Vitamin D. Most processed foods, and foods not cooked in your home, are full of polyunsaturated fats. Choosing your food with care, and thinking about what fats are needed, and which fats are not, is a great way to increase your Vitamin D. For a list of foods that are high in good fats, check out a previous post of mine here. That isn't to say that fat is better, and that we should stop watching what we eat. Obesity can be a major concern when looking at Vitamin D levels. Because Vitamin D is stored in fatty tissues, obese people need more Vitamin D in order to be able to use their Vitamin D. Our bodies put this amazing Vitamin in storage before using it. Obese people simply have more storage to fill up than an average sized person. This means that obese people have to consume/synthesize more Vitamin D in order to stay healthy. Another reason for the recent increase in Vitamin D deficiency is simply fear. We, as a society, have become absolutely scared of cancer. One of the links that has been made between cancer and our skin is the sun. Now being careful in the sun is really important because the more you burn the higher your risk of skin cancer gets. However, wearing sunscreen of SPF 8 or more reduces your body's ability to synthesize Vitamin D by 90% or more. Once you reach SPF 30 or more, you reduce your synthesization by 99%. The, previously mentioned, 10 minutes a day recommended by experts, should be without sunscreen for maximum effect. Also, if you increase your intake of good fats (omega-3 fatty acids) you can reduce your risk of burning, as they help to protect your skin from the inside out. Amazingly enough, these are the same fats needed for synthesization and storage of Vitamin D in your body. Also, you are much more likely to develop skin cancer when you are deficient in Vitamin D.
The last reason for Vitamin D deficiency that I want to touch on is pharmaceutical usage. Quite a few, commonly prescribed, drugs actually block or consume Vitamin D in your body. If you suspect that you may be at risk of being Vitamin D deficient, talk to your doctor to determine if your prescription may be contributing to the problem. Oddly enough, we are one of only two beings on this planet that actually synthesize Vitamin D in our bodies. The other one is rather fascinating, mushrooms. Just about any kind of mushroom synthesizes Vitamin D in the same way as us, and it's the same Vitamin D that we synthesize, D3. Mushrooms also synthesize this after they've been harvested, so laying mushrooms in the sun before cooking them increases the amount of D3 they contain. It's a great way to increase your intake and reduce your chances of becoming deficient. You can also get more Vitamin D from healthy fish, eggs, dairy, fatty meats, liver, cheese, and a few vegetables. However these, and most supplements, are Vitamin D2 and therefore not as bioavailable to us as Vitamin D3 is. If you plan on supplementing, try to find one that lists D3. Another good source of Vitamin D is cod liver oil. It may not taste the best, but it's super good for you in so many ways, probably because it's pretty high in Vitamin D.
I hope I have helped you understand the nature of Vitamin D deficiency, and provided a good start to help you overcoming or preventing it. If you have any questions or comments please leave them below.